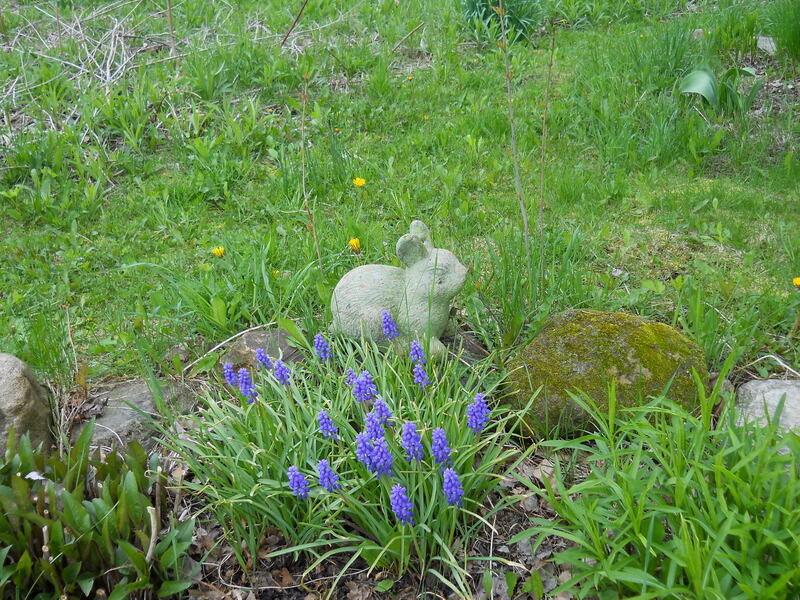 Peter Rabbit is waiting for spring so he can go back in the green garden! Rabbit Rabbit everyone! We’re finally in APRIL! Last week I said a big goodbye to winter; this week I’m saying hello to spring! And what better way to do that than with asparagus? I buy asparagus by the pound this time of year. Last year I believe I actually got the question before dinner, “Asparagus? Again?” I love just roasting it (check out my recipes from last April! 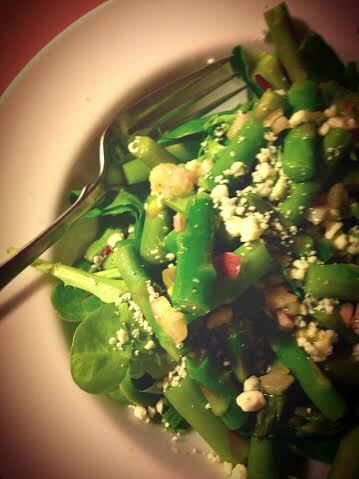 ), but this recipe just calls for blanching and adding to a salad. A new way to use it! What’s not to like with this salad? I never use lemon zest in anything, but I just might start. The addition of that brought a certain brightness to the dressing that just said spring. And gorgonzola cheese is one of my favorite cheeses; my favorite salad is romaine salad, olive oil, gorgonzola cheese and salt and pepper. So easy but SO good! This recipe serves eight, so it would be a perfect side dish for your Passover or Easter dinner if you’re cooking for a crowd, or you can make it as a side salad for a weeknight supper. I just placed everything in individual bowls and topped with the salad dressing. And had some dressing left over for lunch the next day! I don’t usually see white asparagus in the produce section, so I used all green. Just as tasty! This recipe first appeared in the March 2010 issue of Cooking Light magazine. 1. Cook asparagus and 2 teaspoons salt in boiling water 2 minutes or until crisp-tender. Drain and rinse asparagus under cold water; drain. 2. Combine remaining 1/4 teaspoon salt, shallots, and next 4 ingredients (through pepper) in a small bowl, stirring with a whisk. Stir in 1/4 cup cheese. 3. Combine asparagus and greens in a large bowl. Drizzle with dressing; toss gently to coat. Sprinkle with remaining 1/4 cup cheese. It’s Wednesday, and if you’re like me and you still don’t know what you’re going to make for your Friday or Sunday dinner, here are some suggestions! These publications have lots of delicious recipes for your Easter and Passover dinners! 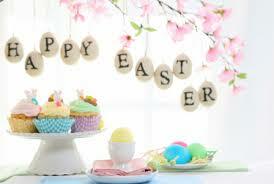 Easter always signifies to me the end of winter and the first real springtime meal of the year. With Easter so late this year, I’m already in full swing with the spring vegetables and recipes: radishes, baby beets, and asparagus. When I see California asparagus in March, I know spring has arrived. (To get local asparagus, I’ll have to wait until at least May!) With the traditional Easter dinner always a bit on the heavy side: ham, potato salad and/or sweet potatoes, I like to counter it with some roasted asparagus to signify the new season and to lighten up the meal! 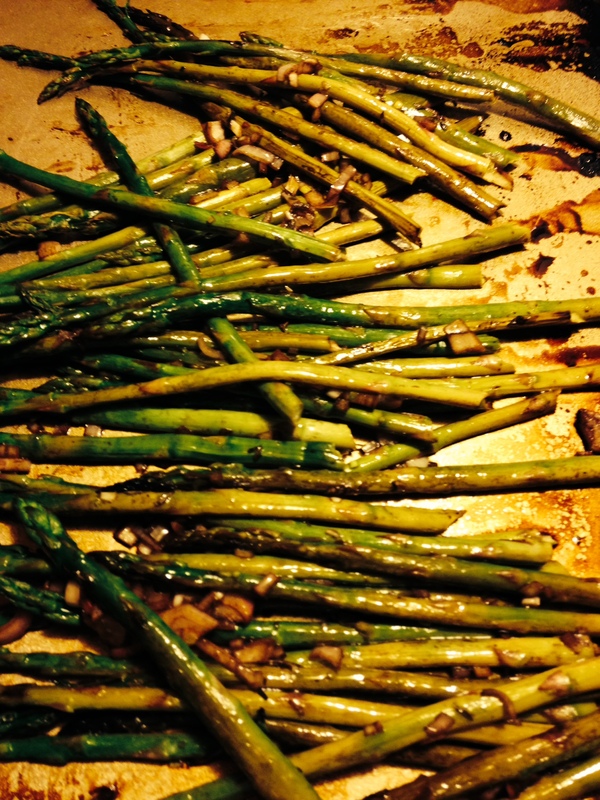 These are two ways I roast asparagus that are easy and delicious. Hardly any fat and calories and true confession, I’ve been known to make a sheet of this for a solo dinner. Balsamic vinegar is always a wonderful addition to any dish, since a little goes a long way. 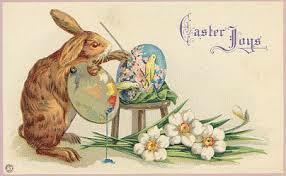 I hope everyone has a wonderful holiday and the Easter Bunny is good to you! 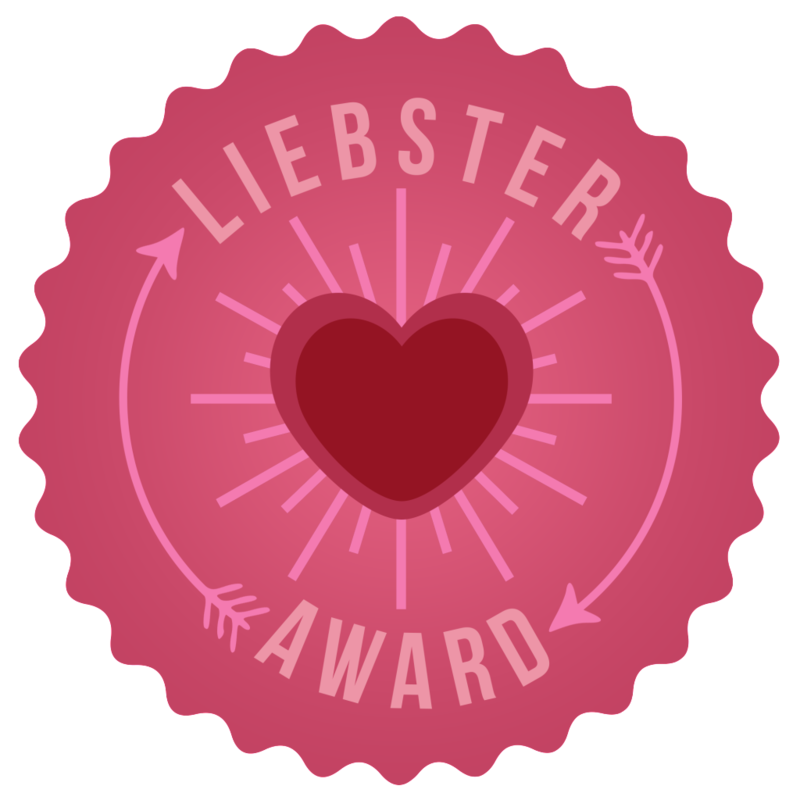 I am taking a week or two off to celebrate my birthday as well as take part in an exciting event (check out this week’s endorsement following the recipes)! This recipe originally appeared in the November 2002 issue of Cooking Light magazine. Make the butter ahead of time, if you like. Roast the asparagus and toss it with the butter just before serving. Combine shallots, butter, vinegar, thyme, salt, and rind, stirring well with a whisk. Snap off tough ends of asparagus. Arrange asparagus in a single layer on a jelly roll pan coated with cooking spray. Cover with foil; bake at 450° for 5 minutes. Uncover and bake an additional 10 minutes or until asparagus is crisp-tender. Pour butter mixture over asparagus, toss gently to coat. Serve immediately. 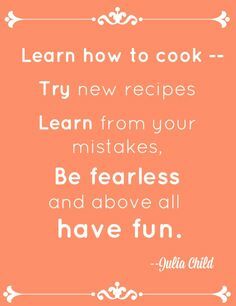 This recipe originally appeared in the October 2013 issue of Cooking Light magazine. Toss roasted asparagus in browned butter, seasoned with soy sauce and a splash of balsamic vinegar, for a super easy side dish that’s big on flavor. 2. Arrange asparagus in a single layer on baking sheet; coat with cooking spray. Sprinkle with salt and pepper. Bake at 400° for 12 minutes or until tender. 3. Melt the butter in a small skillet over medium heat; cook for 3 minutes or until lightly browned, shaking pan occasionally. Remove from heat; stir in soy sauce and vinegar. Drizzle over asparagus, tossing well to coat. Serve immediately. Note: Finish the asparagus just before serving dinner. Cooking the butter until it browns slightly gives the dish a nutty flavor; watch carefully, though, since it can burn easily. 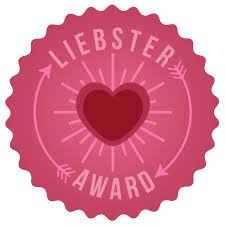 This week, I am endorsing myself! I have the wonderful opportunity to moderate a food discussion with author and food historian, Abigail Carroll, at this year’s Newburyport (MA) Literary Festival on April 26. 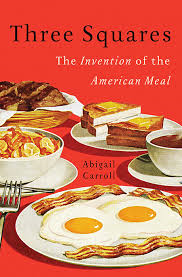 The session is titled “The Invention of the American Meal” and we will discuss Abigail’s book, Three Squares, and the history of our American eating habits. I found her book a fascinating glance at history regarding the three square meals we eat every day. Here is a link to the festival’s website, http://www.newburyportliteraryfestival.org. If you are in the area, I’d love to meet you in person! Hopefully I will return with a recap of the event, if all goes well! My Vermont Kitchen Goes on the Road! My Vermont Kitchen took a week off from cooking and got out of the kitchen! A trip to Florida at the end of the month was just what the doctor ordered. Although it was cool by Southern standards, it was of course warmer than Vermont. Upon our return, the sugarhouses were in full swing, as is mud season; a symphony of birds can be heard in the meadow each morning, and I discovered crocuses, tulips, daffodils, and buds on the lilac bushes in the garden! Spring will soon be here! In the meantime, I took some food pictures from some of my adventures. Yes, I was a crazy woman taking pictures of food amongst the regular shoppers! 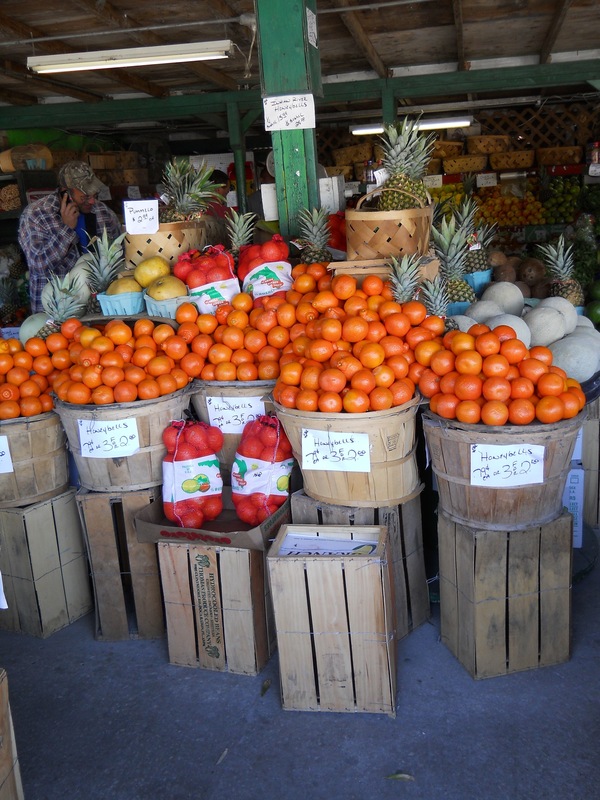 Farms stands pop up in Vermont and upstate New York probably the earliest being late May, so a trip to Tommy’s vegetable and fruit stand in Holiday, Florida, was mecca for me. The colors were vibrant and everything looked gorgeous and delicious. 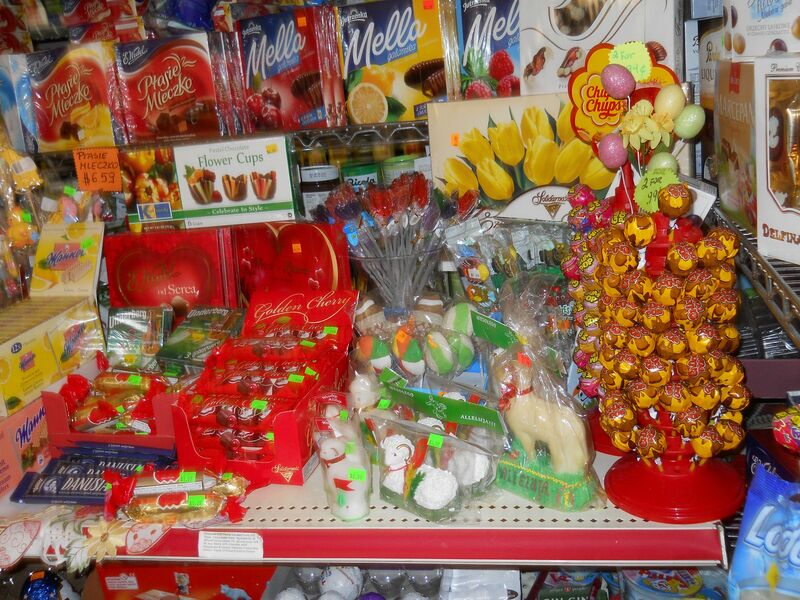 Next was a trip to Goral Polish Deli, where shoppers buying early for their Easter dinners, and me wishing I had another suitcase to fill with all the delicious food found on their shelves. 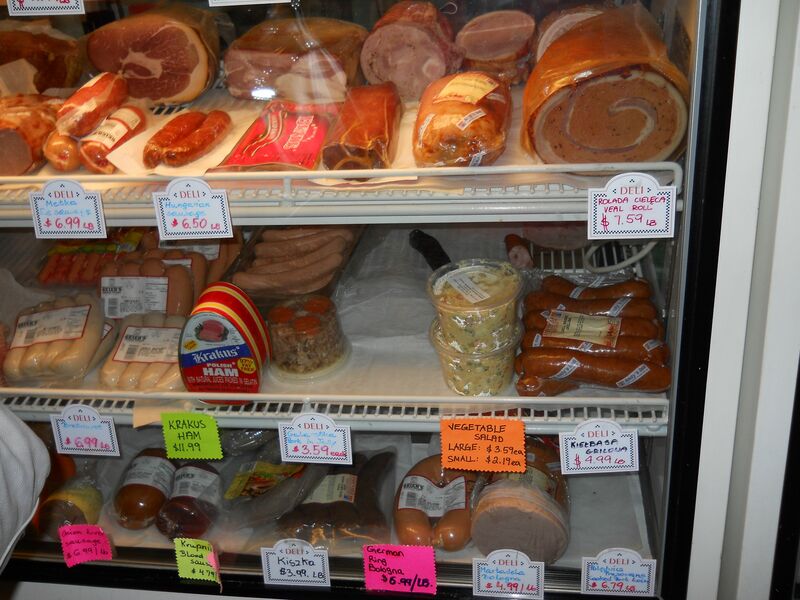 We picked up pierogies and kielbasa for dinner. Yum! I don’t have a market of this sort locally so I was in heaven, checking out all the different jars and packages of delicious-looking foods. And finally, a trip to the Greek Festival here at home. The Saturday before Easter, a local Greek Orthodox church celebrates the holiday with a pastry and food festival. I always make a quick trip into town to pick up a box full of pastries to have with my morning tea and to share, since I don’t bake a lot at Easter. So enjoy the photos and next week I’ll be back with another recipe. Spring is in the air, so I’ve said goodbye to root vegetables, heavy meat dishes, and comfort foods– winter is finally over! 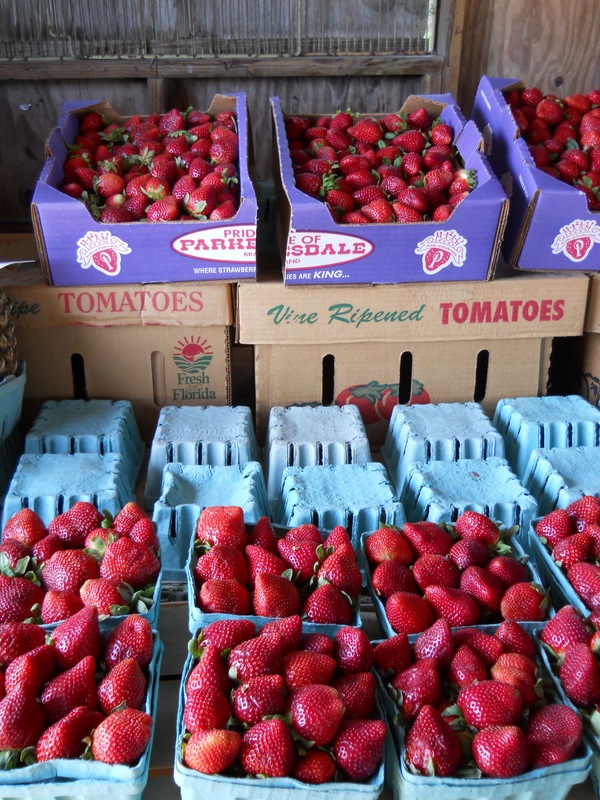 Aren’t these ruby-red strawberries beautiful? They were delicious, too! 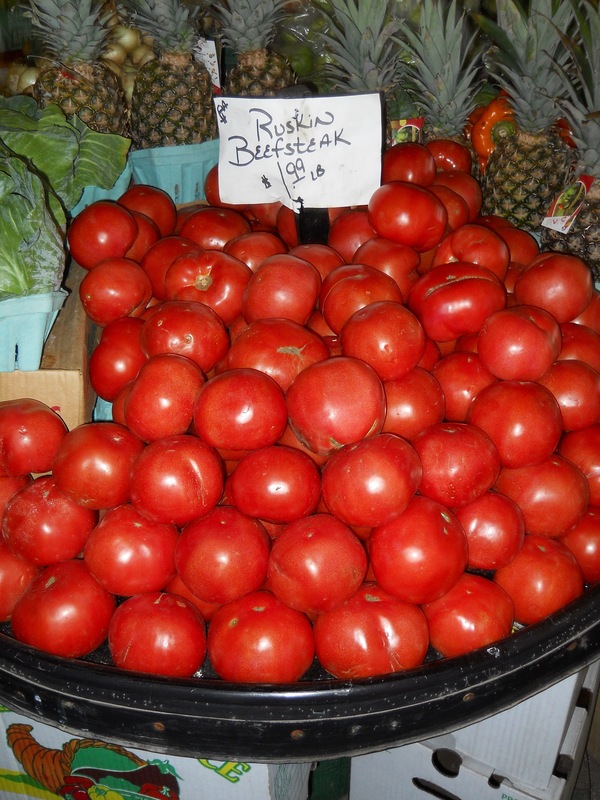 I thought this display of beefsteak tomatoes was gorgeous! 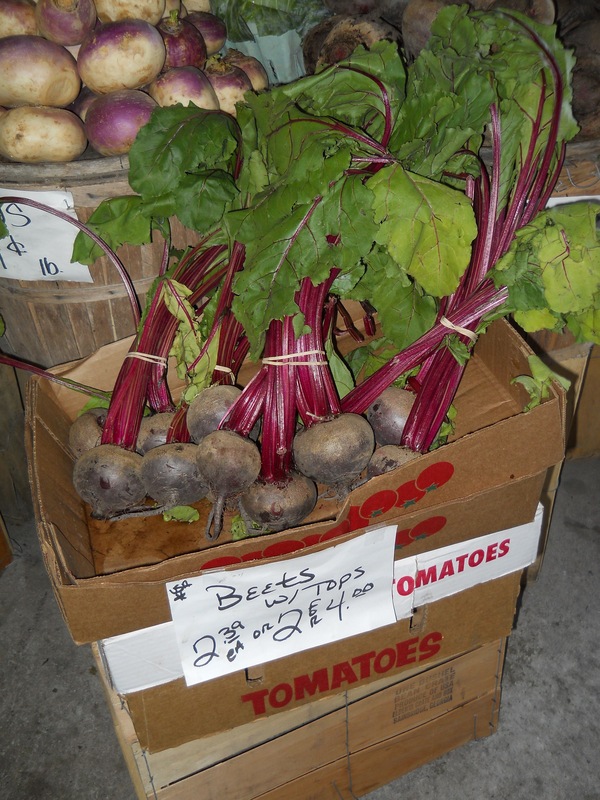 I love beets and was very jealous of the price! 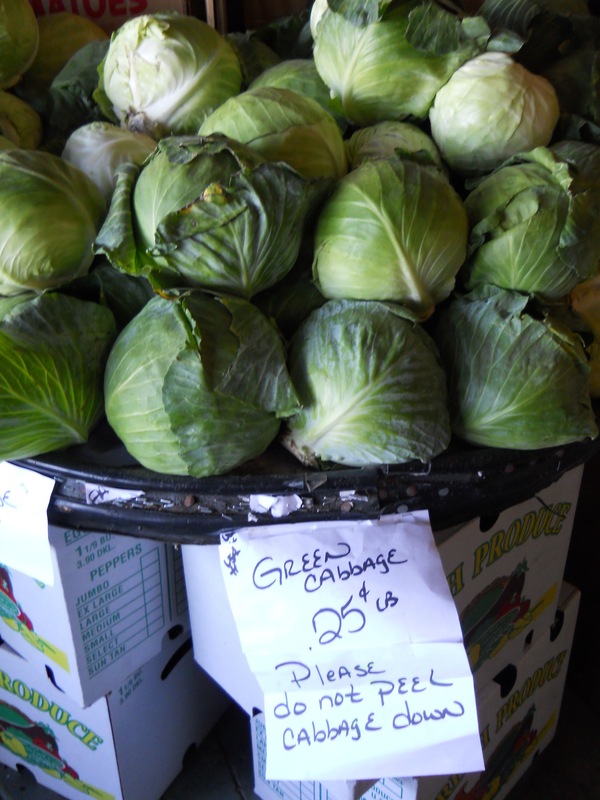 Look at the price–and size!–of the cabbages! A colorful display of oranges. 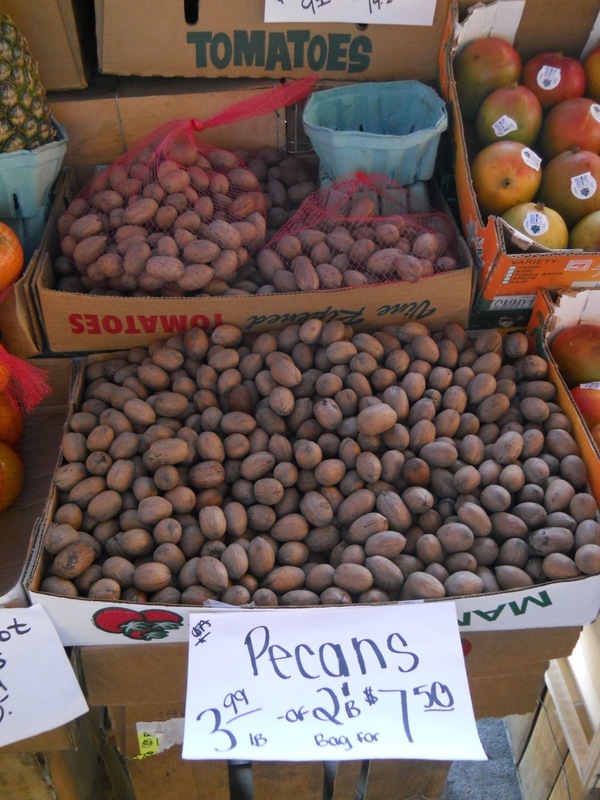 Pecans! I did think about filling an extra suitcase full of these nuts! 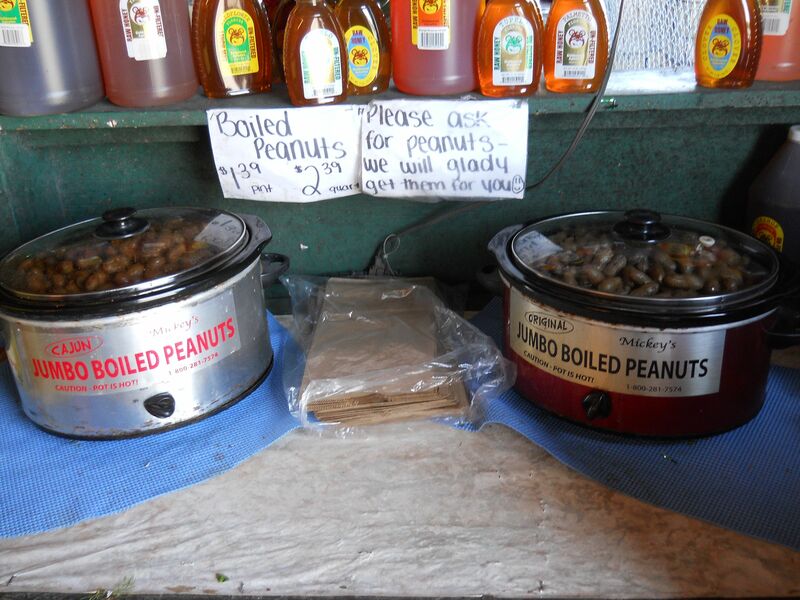 A trip to Florida isn’t complete without some Cajun boiled peanuts! 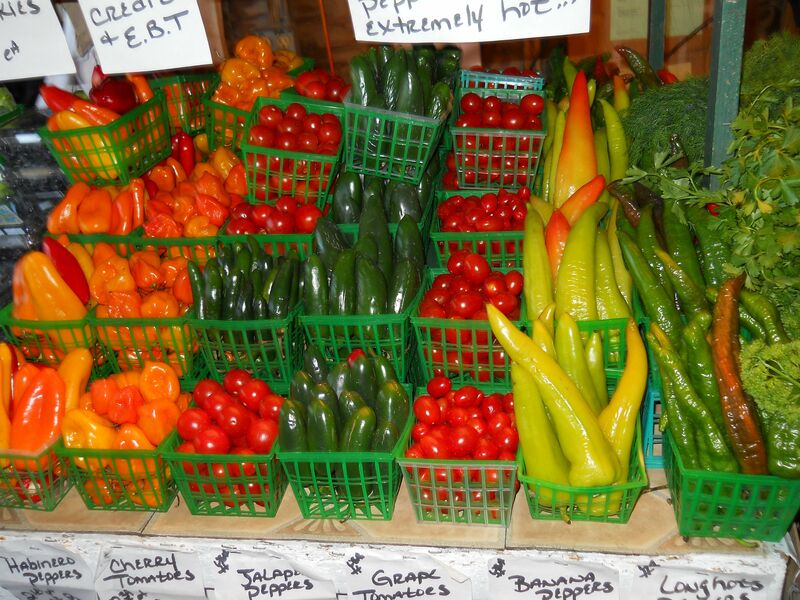 I couldn’t resist taking a photo of these beautiful peppers. 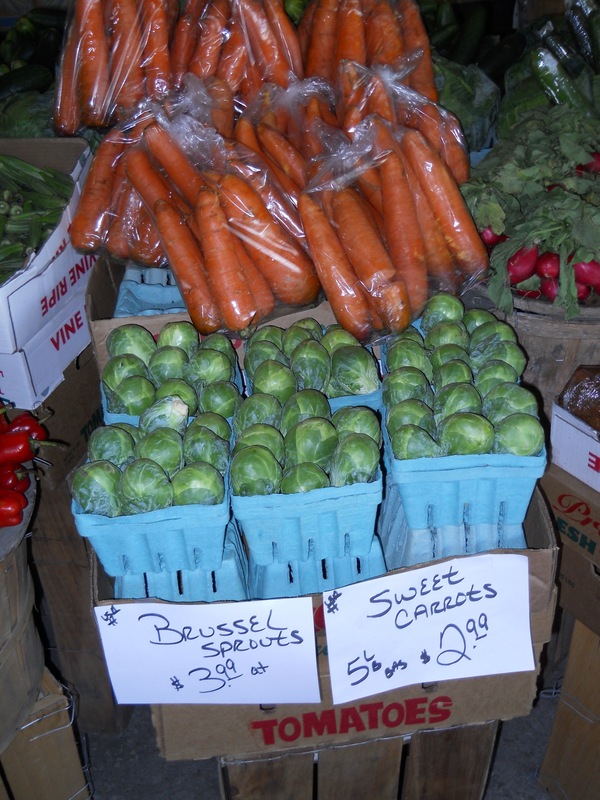 You know how much I love Brussels sprouts, I thought these were beautiful. 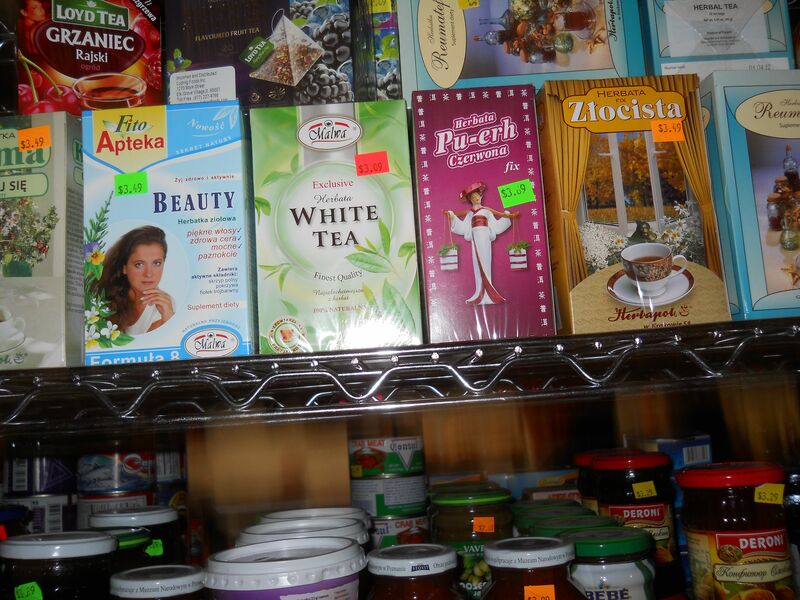 I was fascinated with the different kinds of tea. 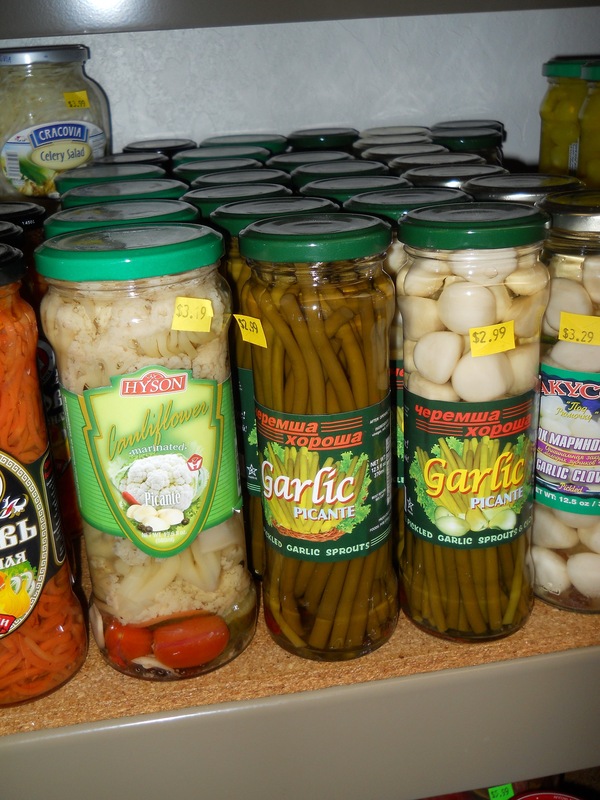 I loved the jars of garlic shoots. 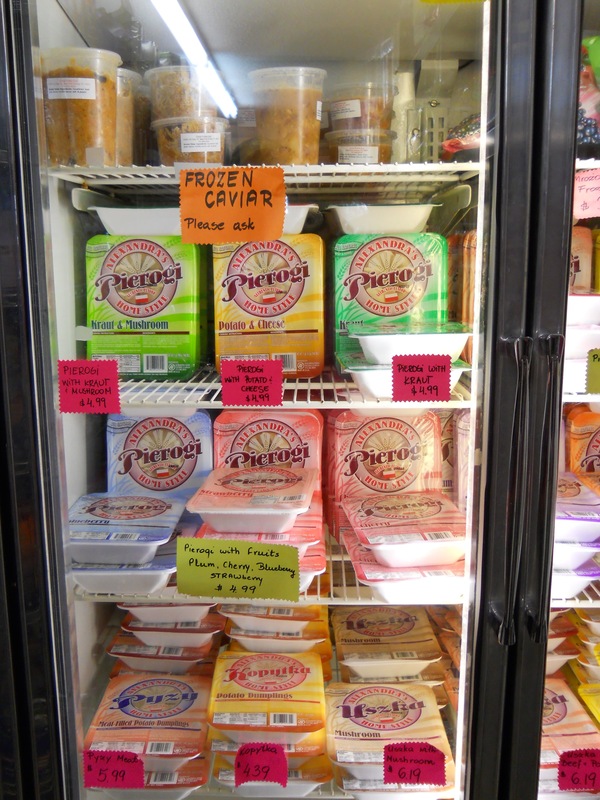 I love pierogies, but I thought the sign for frozen cavier was interesting! 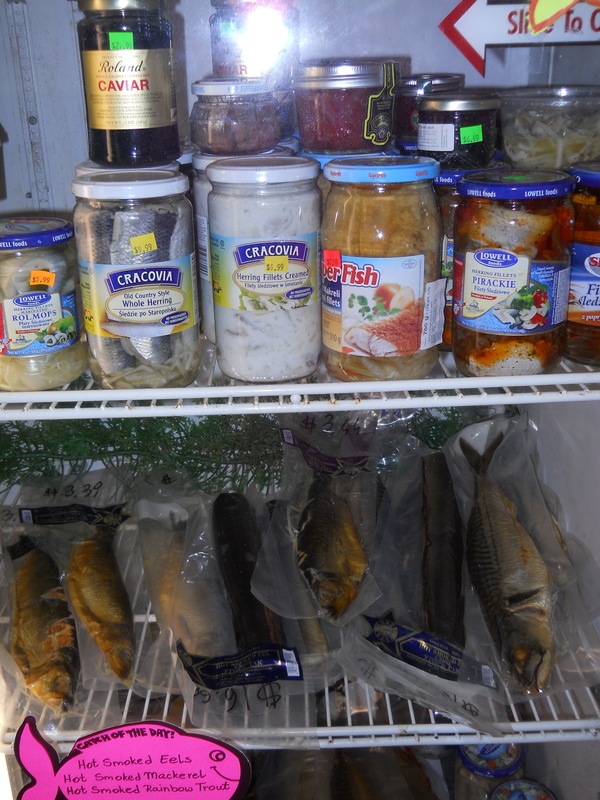 All sorts of delicious fish. 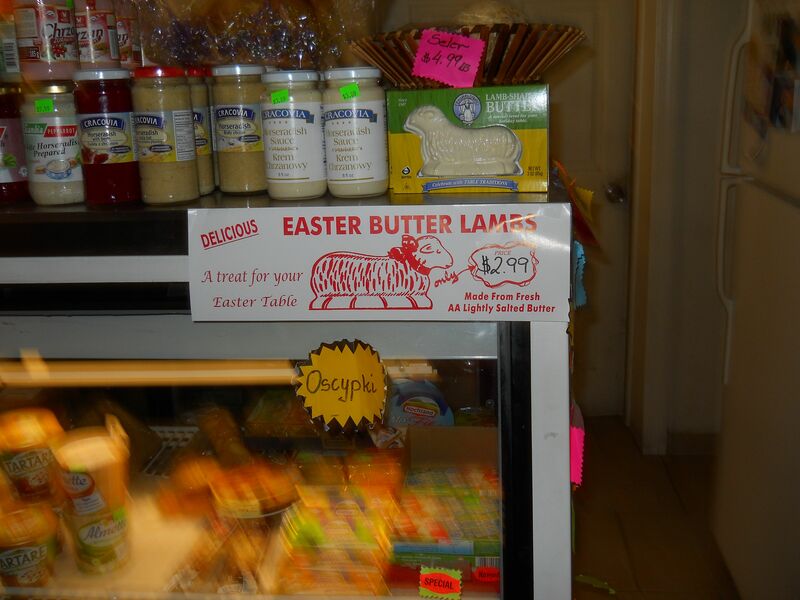 And yes, I did want to buy a butter lamb for my Easter dinner! 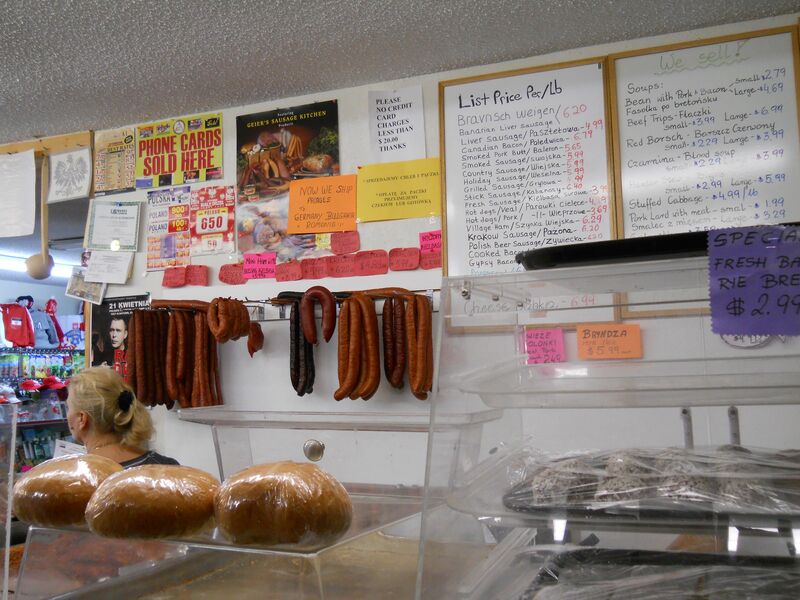 The various kielbasa hang from the store’s wall. 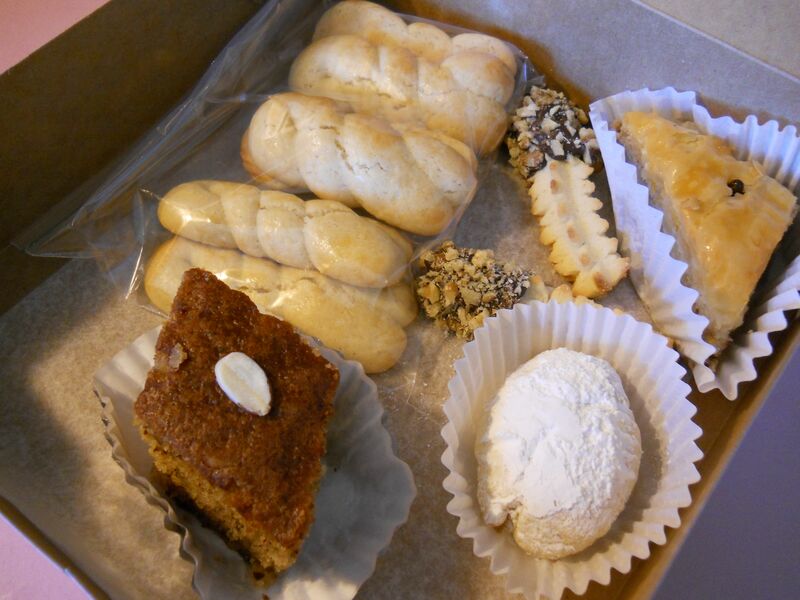 This year’s Greek pastries, baklava, ouzo cake, and various cookies.